Over the past few years, the FTS team has been invited to participate in Brother Bill's Helping Hand Back to School Bash. Brother Bill's Helping Hand (BBHH) is a nonprofit organization in the West Dallas area that focuses on education, health, and life essentials for children and their families. They reach out to the community, listen to and learn from their neighbors, and partner with volunteers to meet these needs. Last year my family was able to participate in the Back to School Bash by helping run one of the games and activities booths. This year we were able to host a family as they went through the various stations throughout the event. We got to know the family we were paired with as the two daughters received free haircuts, were each given a backpack filled with school supplies, and enjoyed lunch. The girls' mother was very appreciative and expressed her sincere gratitude many times. The father of the family was there as well, but had been asked to give back and volunteer with the food prep for the day. As I spoke with Wes Keyes, the executive director for BBHH, he explained that they engage the neighbors to cook the ethnic food provided and try to involve them as much as possible so there is a feeling of empowerment. As they serve together, they get to know one another, making it an honorable exchange. This year they collected enough funds and supplies to give out 850 backpacks. Both years I have appreciated that this service opportunity was family friendly and allowed my four small children, ages 8-2 to be involved as well. Often times it's hard to find ways to serve as a family, but I know it's important to teach my children the value of service. So why is finding ways to serve so important? 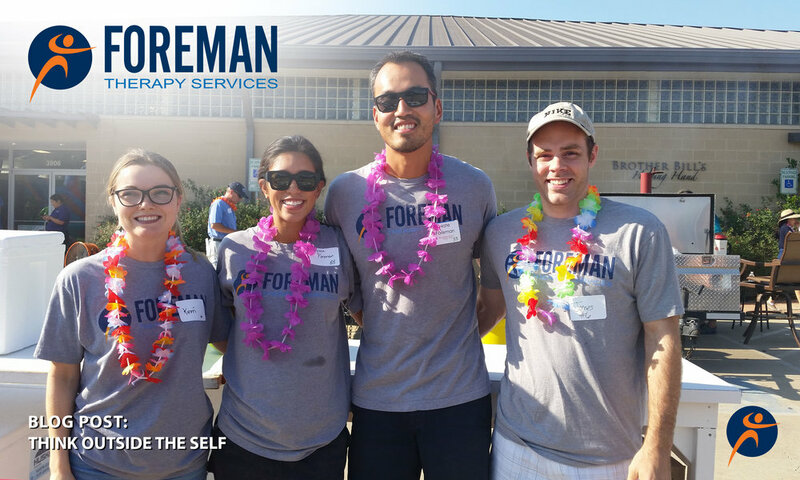 As Mahatma Gandhi said, "The best way to find yourself is to lose yourself in the service of others." Research shows there are many benefits we can receive as we serve others. Service has been known to increase happiness, help people live longer, reduce chronic pain, lower blood pressure, and give people a better sense of purpose. As we serve alongside others, we are able to make new friendships, feel greater love, and have an increase in gratitude. We can make a big difference in the lives of those we serve, as well as our own. So, I want to encourage you all to go out there and find ways to think outside yourself and volunteer and serve!